If we were to glance around the table of the new Denominational Executive appointed at the 43rd General Council of the United Church of Canada, we would note, perhaps, the diversity that was there. With intention, this executive draws from people who bring different backgrounds and complexity in ethnicity, ministry in the church (paid accountability, ordered and lay, years of service and participation), professional and life experience, physical ability, language of origin or common use, region of the country and age. The 18 member Executive is made up of 15 people who bring “competencies in theology, governance, finance, and vision” and “reflect the diversity of an intercultural church, lay/ministry personnel and geography”, plus the moderator, past moderator and general secretary. A particular distinction of this Executive is that members “serve on behalf of the whole of the church, rather than as representatives from any one part of it.” So, although they may carry these various distinctions and the perspectives that come with that, they don’t represent constituencies. Deb Hinksman is one of the people at the table. She is a diaconal minister with over 30 years in ministry. “When I looked around the room I can see each person mentally sitting where they were.” she said, “We as a group are very United Nations in terms of diversity of ethnicity and experience. We are quite an eclectic group. It’s really fascinating. “I am the old white woman there. I am that 63 year old white woman that is not UCW. I am a very definite demographic in that room. I don’t see that as a bad thing. I just notice that here I am at the end of my ministry doing the same thing that I was doing at the beginning of my 37 plus years of ministry. It’s interesting. However, as other options “seemed to yield a closed window,” she wondered if she ought to consider ministry after all. Shortly after, she found herself a candidate for ministry. For ordination. 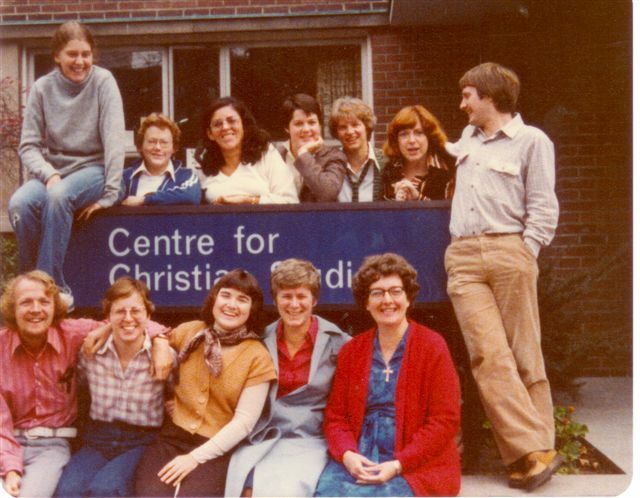 Click here to read about Deb’s experience as a student at the Centre for Christian Studies in the 1970s. That sentence changed Deb’s life. Terminology was evolving at that time from deaconess, certified church man and commissioned minister to diaconal minister. Deb was commissioned in 1980 at a time of great change concerning issues of pay parity and whether Commissioned Ministers should be subject to settlement. “I never have,” she said. “I’ve never felt I can’t fulfill my call. It still makes me chuckle, 38 years later. When reflecting on what she brings to the executive table, Deb noted her diaconal background, love of process and moving through things with flow. “Being a diaconal person means that I intentionally try to look at the bigger picture and at the process of how we’re doing things. I ask who is included and is not included. “One of the things I brought to the table was a question. What do people need from us as the Executive? What does the United Church need from the executive in this time of its transition? Is it up front leaders? People that encourage? A group that gives resources? If it’s true that we want to do things differently, if we want to be different, what do we as the Executive need to be for the people of the United Church? “My perspective of bringing joy and lightness is probably important. I think it’s going to be fun to be part of executive. “When we sat with the Moderator, he shared some of his hopes coming out of the question ‘What does it mean to be a Christian and a follower of Jesus in the 21st Century? A subtext to that is the caretakers’ call to the church for what we need to do if we’re really going to have Truth and Reconciliation and If we’re really going to deal with the “isms” of society and in our church, in particularly racism and ableism. “When we talk about colonialism and racism, I am acutely aware that the average person in my church won’t have a clue what it means. ‘What do you mean I’m colonial?’ My diaconal self is saying, ‘What is the process that we use to bring that kind of conversation to the average person in the pew?’ There’s that combination of how do we help them in understanding the why and how do we acknowledge just where they are? Can we accept them as where they are? I hope I can help us bridge that. I think that one of the things about being that older white woman is that I get it. I think that I can be helpful in speaking to that, as to why we need to pay attention to it. I’ve been much more aware of my own racism, like noticing that I will ask the Indian-looking cabbie ‘where are you from?’ but not caucsian ones. “It’s a fascinating time to be church right now! Man! So, what I think about the executive and their passion for moving forward, if we really believe that the gospel is about transformation, how do we help the transformation of the average person in the pew? One of the things that I can be helpful with is asking questions that help us unpack what’s at the heart of something. Deb is currently in ministry at Delhi United Church in Ontario. She graduated from the Centre for Christian Studies in 1979. Thanks Deb. You are a worthy rep and hope for the UCC. Blessings.